Modern prefab homes: house plans taken a step further with passive solar prefab house kits built with SIP (structural insulated panels). Each of our prefab green homes is a modern house kit / green building house that provides you with a modern house kit / modern home solutions, energy efficient cabin, planned with achievable green net zero energy and off-the-grid possible through passive solar design and energy efficient SIPs. We are green building architects, house kit fabricators, industrial designers and idea people who create modern, eco friendly affordable green housing and furniture plans for all of us. 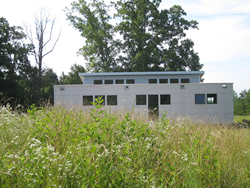 Affordable Prefab Green Homes Built With Passive Solar & SIP! 1. casa ti passive solar one story modern living that emphasizes the outdoors. See construction of our net zero off-the-grid prototype here! 2. 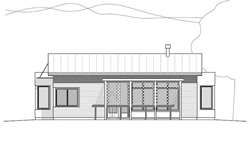 The R1 Residential gorgeous, passive solar, energy efficient two story prefab home design with lots of green options. 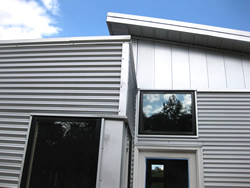 Here, you find SIPs ( structural insulated panels), thermal mass and passive solar design. Architecture that allows for your personal customization and budget. Time-tested solutions with the latest sustainable housing technology. In our world, we have kitchen gardens; don't have time for zen. This site is for those that appreciate practical, modern design. See ideas. Save up for a green goal, whether it be a solar cooker or a prefab green modern passive solar house kit. Reduce dependency on precious resources AND financial loans. Save for, invest in, then enjoy for generations. Affordable Prefab Houses We make Green Homes More Affordable- We provide the kit, you finish with your contractor! Kit Prefab Houses Are built with SIPs (Structural Insulated panels), Passive Solar, easily Net Zero and Off Grid if you like!